T minus 6 days and counting for Vivian Campbells "Two sides of If"
October 28 - Rammstein's new album, "Rosenrot"
Plus they are shooting a video in Grand Rapids MI on Sept 28, that would be cool to be at that show. On September 28th, at Van Andel Arena in Grand Rapids, MI, System Of A Down want you to be a part of history. SOAD will be filming the video for "Hypnotize," the first single off of Hypnotize. Click here to buy your tickets now at ticketmaster.com, and make sure not to miss this very exclusive event. New Coheed and Cambria album... "IV: Good Apollo..." and new Arcturus, "Sideshow Symphonies" were just released... I NEED THEM! Atlantic Records is billing the new Darkness album as 'the biggest release of the year', with a promotional campaign aimed at radio which utilises a 6ft-square record. One Way Ticket, the lead-off single from the band's forthcoming second studio album One Way Ticket To Hell �And Back, will be delivered to national and regional stations next Monday pinned to the huge record in time for an 8.15am radio date. It follows initial plays of the album � which is produced by Roy Thomas Baker � to key media last week. "We have to get the message across that this is the biggest rock record of the last decade and it will be!" says Atlantic managing director Max Lousada. "This album makes you want to drink more, drive faster � it's one of those records. The guitars will rip your face off. The vocals send shivers up your spine. Singles � I see four, the band see six. I'm comfortable, let me put it that way." Ahead of the single's radio debut next week, Atlantic is following the example of fellow Warner signing Madonna by initially making the track available as a real audio ringtone. It will be available from this Friday on the band's website as well as traditional mobile operators, to kick start the campaign for the follow-up to 2003's Permission To Land which has to date moved more than 3.5m units globally. The single will be released physically on November 14, two weeks ahead of the album. Well fans only 1 week away from the premiere of the new Depeche Mode album, "Playing The Angel". "A Pain That I'm Used To", "John The Revelator", "Suffer Well", "The Sinner In Me", "Precious", "Macrovision", "I Want It All", "Nothing's Impossible", "Introspectre", "Damaged People", "Lillian" and "The Darkest Star"
Please note: No particular order. Edited by Ru5h F@n, 11 October 2005 - 09:14 AM. BTW, this slipped by me and maybe a few of you, but Roger Waters latest piece of work, a 3 piece opera named Ca Ira, was released last week. But no worries, Alex Lifeson joined the band! IT'S OFFICIAL! The near platinum success of the North American "ROCK OF AGES" double CD gets an added edge with a companion DVD, called "ROCK OF AGES: THE DVD COLLECTION". The release assembles the band's greatest videos for the first time on one DVD, along with the video for "NOW" (previously unavailable in North America). Also included is the brand new, 2005 rehearsal bonus video for the band's #1 CLASSIC ROCK song, "NO MATTER WHAT". As added bonuses, the audio has been remastered with DTS & Dolby 5.1 surround sound and Dolby stereo, a first track-by-track commentary by the entire band is included, and there is a Personal Playlist option, where the viewer gets to sequence each video to their liking. "ROCK OF AGES: THE DVD COLLECTION" is released in the USA and Canada on November 8. 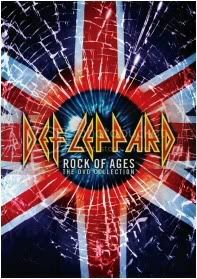 This should be cool, it would be nice to see a new concert on this DVD, i mean the ONLY FULL DEF LEPPARD Offical DVD live show is gonna be 18 years old!! Interests:Going to concerts, Drumming, Drum Corps, U.S. History, Music History (Jazz and Psych/Prog Rock), Console Gaming, Model Building, Collecting Vinyl. Interests:My 1999 Chevy Malibu, buying CDs, collecting anything to do with Pink Floyd, Genesis, Rush and the Red Sox. Also the Patriots. Edited by Moonraker, 02 December 2005 - 12:06 PM. I am not bulls**tting on the new David Gilmour album! Roger is working on two rock albums as soon as his opera is done. Roger on the BBC Radio 2 stated the possibility of working on another album with PF. They will do some shows ala Cream and do a Last Waltz type thing! LOS ANGELES � Queensr�che returned to the studio this summer to record the long-anticipated sequel to 1988�s acclaimed concept album Operation: Mindcrime. Praised by critics and certified platinum, the original remained on Billboard�s album chart for more than a year and its dynamic music and powerful message still resonate today. Rhino Records helps unravel the mysteries of the original with OPERATION: MINDCRIME II. The album is available March 14 at regular physical and digital retail outlets and at www.rhino.com for a suggested retail price of $18.98. OPERATION: MINDCRIME II contains a 15-song story and is performed by the Seattle-based quintet � singer and chief songwriter Geoff Tate; guitarists Michael Wilton and Mike Stone; bassist Eddie Jackson, and drummer Scott Rockenfield. Edited by kazzman, 07 December 2005 - 09:59 AM. DAVID GILMOUR - ON AN ISLAND! Pink Floyd guitarist David Gilmour has more than one reason to celebrate on his 60th birthday next year - March 6th 2006 sees the long-awaited release of his new solo album "On An Island" with a US release date March 7, 2006. Released on EMI Records in the UK and Capitol in the US, the album is the first solo release from David since 1984's "About Face" 22 years. Following the release of "On An Island", David will embark on a European and American tour during the months of March, April and May 2006 - and we should have details of these dates soon. "On An Island" is produced by David, along with Chris Thomas(whom mixed Dark Side of the Moon) and Phil Manzanera(Roxy Music guitarist). Orchestrations are by the renowned composer Zbigniew Preisner and were recorded at Abbey Road Studios in London. The title track teams Gilmour with David Crosby and Graham Nash - three of the greatest voices in contemporary music. Fellow Floyd member keyboardist Richard Wright, Robert Wyatt, Jools Holland, and Guy Pratt also feature on the album. Tate says the band plans to launch a tour in 2006 that will feature a stage performance of both Mindcrimes in their entirety.